The latest album from the voice of Led Zeppelin is another top-notch, adventurous collection of music that’s nearly impossible to classify. Can I just begin by saying how thrilled I am that Robert Plant continues to make wonderfully unique music well into the 21st century? This is a man who once fronted one of rock music's most powerful, influential bands and could very well have slipped into irrelevance and cheesy nostalgia tours, but his post-Led Zeppelin career has always shown him to be an artist who prefers to take the road less traveled -- or at least the one less predictable. Plant began cranking out solo albums in 1982, two years after the death of Zeppelin drummer John Bonham, and the music he was producing was decidedly different than what was probably expected of him at the time. Most of his singles throughout the '80s -- notably “Burning Down One Side", “Big Log", “In the Mood", and “Little By Little" -- probably had more in common with indie rock than bluesy metal. His mid-'80s all-star R&B/rockabilly project, the Honeydrippers, was another earnest exercise in conscious diversion. But his 1988 smash Now and Zen seemed to indicate that Plant was copacetic with his past, going so far as to sample Zeppelin riffs in the pulverizing single “Tall Cool One". Still, he remained intent on moving forward. In a 1988 Rolling Stone interview with David Fricke, Plant was generously name-dropping current favorites like Hüsker Dü and Faith No More, going so far as to say, “If I made a record tomorrow that sounded like parts of R.E.M. 's Document, , I'd be really pleased." 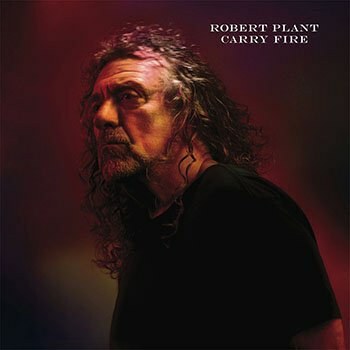 While occasional one-off Zeppelin reunions have surfaced here and there (including both their train wreck of an appearance at Live Aid in 1985 and the warm, intimate Page/Plant collaborations of the mid- to the late '90s), Plant is still moving forward, and his latest album, Carry Fire is an excellent example of a legendary rock star who no longer needs to prove anything yet still refuses to phone it in. Carry Fire reunites Plant with the Sensational Space Shifters, his backing band that helped make the 2014 album Lullaby and… the Ceaseless Roar such a lush, psychedelic delight. The tribal rhythms and organic instrumentation (combined with tastefully executed synths and samples) are back, to the extent that Carry Fire could almost be seen as a welcome sequel to that fine album. The sound has an almost folky, campfire feel, but true to Plant's musical roots, most of the songs here are embedded in the blues. Opening track “The May Queen" rolls along a heavy percussive groove with acoustic guitars and fiddles creating an intoxicating noise. “Lay down in sweet surrender," Plant purrs, “Your love so warm and tender." The organic, unassuming style of musicianship also lends itself to tracks that are slightly more traditionally “rock". On “New World…", slashing electric guitar chords rain down while a chugging mid-tempo beat moves this along in unhurried, hip-swaying fashion. “Bones of Saints" seems to be a nod to earlier Plant solo material -- the driving beat and guitar interplay suggest a grizzled, lazier version of “Tall Cool One". But much of this is somewhat uncharted territory for Plant. I have yet to hear anything in his solo catalog like “A Way with Words", a startling, abstract, almost jazzy set piece. Piano, strings, and gentle percussion are just a few of the instruments that provide sympathetic backing to what's perhaps Plant's most delicate, vulnerable vocal performance committed to tape. Likewise, “Keep It Hid" combines insistent, almost trance-like percussion with sci-fi keyboard riffs, sounding like a welcome, newfound Radiohead outtake. Plant's love of Eastern scales and instrumentation are evident in Carry Fire's title track, and his penchant for woodsy, Tolkien-ish folk continues with the epic “Season's Song", another track that, like “A Way with Words", shows Plant edging more into a place of maturity without losing any edge. Plant has never been one to drown his solo albums in gratuitous guest appearances, but he makes an exception with one of Carry Fire's strongest tracks, “Bluebirds Over the Mountain", a song written in 1958 by Ersel Hickey and later covered by artists such as the Beach Boys and Ritchie Valens. Plant turns the song into a potent duet with Chrissie Hynde. The song sounds terrific, with gurgling synths and lumbering guitars creating an industrial take on an obscure R&B chestnut. The material, arrangements, and performances on Carry Fire would be impressive for any young, brash newcomer. The fact that it comes from the mind of Robert Plant should be no surprise to anyone who's been following his solo career. It's still a relief to hear something so fresh from a legendary artist with plenty of creative gas in the tank.